Water Point Mapping is a process for monitoring the distribution and status of water points in rural and urban areas. It supports local level planning and can improve accountability for water sector performance at local and national levels. 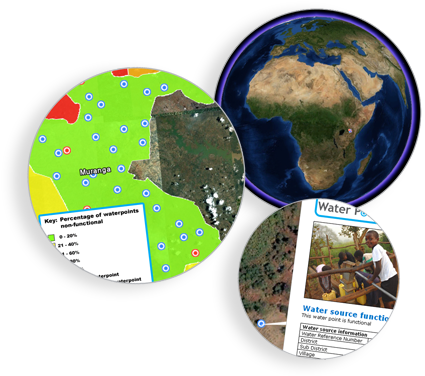 The Water Point Mapper is a free tool for producing maps showing the status of water supply services without the need for complex GIS software. Mobile Water Point Mapper: online, built on mWater, integrating mobile based data collection with data analysis and maps generation. Water Point Mapper Lite: offline, Microsoft Excel spreadsheet and Google Earth based, user- customisable to generate maps from any indicator. improved sanitation coverage and distribution and status of shared latrines in urban areas. The Mapper has point and shape data handling capability so data can also be aggregated and presented at administrative level (i.e. local authority level). The tools are aimed at water, sanitation, hygiene practitioners as well as local governments working at the district and sub-district levels. The Water Point Mapper was developed by WaterAid.